I am still unconvinced that transfusion associated NEC is a real thing, I think it is possibly a real phenomenon, but I am not sure how to know for sure. Some of the best evidence I think comes from the PINT trial, a randomized trial of transfusion thresholds. The preterm infants in the high threshold group received many more transfusions, but did not have more NEC, in fact they had less NEC 5.3% vs 8.5% (RR with restrictive transfusion 1.62 (95% CI 0.8, 3.26). The other 2 RCTs included in the Cochrane systematic review that reported NEC were much smaller and did not contribute much to the meta-analysis which thus gives the same overall RR of 1.62). In the RCTs of later use of erythropoietin, babies in control groups had many more transfusions, but the Cochrane systematic review does not show a major difference in NEC, RR 0.88 with epo, (95% CI 0.45, 1.7). In contrast, the Cochrane systematic review of early use of erythropoietin does show less NEC with epo, and, of course, the epo babies also had fewer transfusions. An observational study from 2016 might explain some of the confusion, They suggest that severe anemia might be associated with NEC, rather than red cell transfusion. (Patel RM, et al. Association of Red Blood Cell Transfusion, Anemia, and Necrotizing Enterocolitis in Very Low-Birth-Weight Infants. JAMA. 2016;315(9):889-97). They used the data from a prospective cohort study of transfusion related CMV in preterm infants; because of variations in practice, as indications for transfusions were not standard, they could attempt to analyze the separate impacts of transfusion and anemia, with a hemoglobin less than 80g/100mL. They included 600 VLBW infants, who had 42 episodes of at least stage 2 NEC. About half of the babies were transfused, and they were smaller, less mature and sicker than non-transfused infants, and 18% had at least one hemoglobin under 80. The rate of NEC was increased in VLBW infants who received RBC transfusions compared with infants who did not (cause-specific HR, 2.33 [95% CI, 1.18-4.60]; P = .01)…. 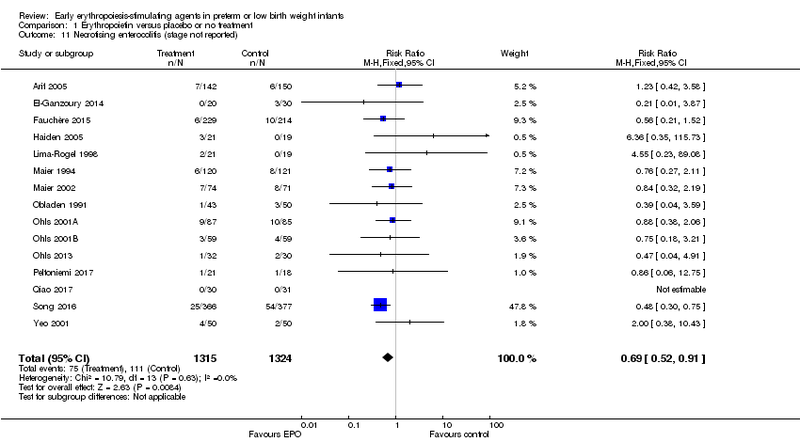 In multivariable analysis, including adjustment for birth weight, duration of breastfeeding, illness severity, severity of anemia, duration of antibiotic treatment, and center, any RBC transfusion in a given week was not independently associated with an increased rate of NEC (cause-specific HR, 0.44 [95% CI, 0.17-1.12]; P = .09) or mortality (cause-specific HR, 1.36 [95% CI, 0.27-6.82]; P = .71)…. In a given week, VLBW infants with severe anemia had a higher estimated rate of NEC compared with VLBW infants without severe anemia (adjusted cause-specific HR, 5.99 [95% CI, 2.00-18.0]; P = .001). Of course because transfusion is used to treat anemia, and babies with more severe anemia are more likely to be transfused, these are things that are difficult to separate, but these data do at least suggest that it is severe anemia, rather than transfusion which increases NEC. I think this all might add together, with early epo there is less severe anemia, and thus, if the association is actually causative, there should be somewhat less NEC; in the PINT trial the high transfusion threshold group were unlikely to develop severe anemia, and so were less likely to develop NEC. In normal clinical practice we are more likely to transfuse the most anemic babies, and thus there is an apparent association between transfusion and NEC. Confirmation of this from another database, and analysis of the TOP trial when completed (I think enrolment has finished and outcome assessment should finish this year) will be important to answer these questions. Does severe anemia really affect the gut? A prospective study from Turkey measured fatty acid binding proteins in very anemic babies before and after transfusion (Ozcan B, et al. Severe Anemia Is Associated with Intestinal Injury in Preterm Neonates. American journal of perinatology. 2019). Intestinal FABP and liver FABP are apparently good markers of intestinal injury, and previously liver FABP has been shown to increase with NEC of all grades, and I-FABP only with very severe NEC. In this new study I-FABP was only slightly higher among anaemic babies than among controls, but liver-FABP was appreciably higher, and remained high 48 hours after transfusion. Another relevant recent publication is from a mouse model (Arthur CM, et al. Anemia induces gut inflammation and injury in an animal model of preterm infants. Transfusion. 2019;59(4):1233-45). In this study they correlated cytokine concentrations in preterm infants with their hemoglobin levels, more anemic samples had higher Interferon alpha levels. They then performed a mouse study gradually bleeding the mice to anemia (PIA ia phlebotomy-induced anemia) and performing a number of fascinating analyses of their intestines. Gradual induction of PIA in a pre‐clinical model resulted in significant hypoxia throughout the intestinal mucosa, including areas where intestinal macrophages reside. PIA‐induced hypoxia significantly increased macrophage pro‐inflammatory cytokine levels, while reducing tight junction protein ZO‐1 expression and increasing intestinal barrier permeability. Preventing severe anemia with a combined approach of delayed cord clamping and erythropoietin should lead to less NEC if these findings are real; a systematic review of delayed cord clamping did show a bit less NEC RR=0.88 [95% CI 0.65–1.18], although they marked the quality of this evidence as low. (Fogarty M, et al. Delayed Versus Early Umbilical Cord Clamping for Preterm Infants: A Systematic Review and Meta-Analysis. Am J Obstet Gynecol. 2017), I am not sure how effective delayed clamping is in preventing late severe anemia, I don’t think that has been reported often in the studies, but early hemoglobin is, of course, higher. But a few weeks later, after being in the ICU for a while, with multiple blood sampling and intercurrent illnesses, the effects of delayed clamping on late severe anemia might well be dissipated. On-going trials of erythropoietin for brain-protection in preterm infants may also be able to answer questions about anemia and NEC, depending on doses and duration. Thinking about it, I am not sure why many of us went of the routine use of erythropoietin, I guess we were all focused on trying to reduce donor exposure, which is generally unaffected with current transfusion practices. I think avoiding blood transfusions and reducing severe anemia are probably valuable goals in themselves. Maybe we should rethink erythropoietin/darbepoietin routine use. I would never have actually thought to ask the question whether platelet transfusion might close the PDA, although early thrombocytopenia is associated with persistent PDA, and platelet plugs seem to be part of the mechanism of closure. A group in India have just published an RCT in preterm infants with a PDA (hemodynamically significant, whatever that means) who had a platelet count under 100,000. Kumar J, et al. Platelet Transfusion for PDA Closure in Preterm Infants: A Randomized Controlled Trial. Pediatrics. 2019. Gestational age averaged 30 weeks, and they were enrolled at a mean of 3 days of age. Median time to PDA closure was identical in the group randomized to receive transfusion (10, 15 or 20 mL/kg depending on the count) and the control group, at 72 hours in each group, data based on repeated echo every 24 hours until closed. All babies received ibuprofen or acetaminophen also. 44 babies were enrolled, and of the 22 in the transfusion group there were 9 new IVH (4 severe, grade 3 or 4) after enrolment, compared to 2 new IVH among the controls, (both severe). In the much older study by Maureen Andrew and colleagues, (Andrew M, et al. A randomized, controlled trial of platelet transfusions in thrombocytopenic premature infants. The Journal of pediatrics. 1993;123(2):285-91). Preterm infants with a platelet count less than 150,000 were randomized to be transfused or not. 12/78 transfused babies developed a serious grade 3 or 4 IVH, and 9/79 controls. The 33% increase in IVH was “not statistically significant” they said, but as you all know that doesn’t mean that it isn’t real! In the recent PLANET2 trial there were more serious bleeding episodes in the transfused babies than in the controls, and apparently most of them were IVH, I don’t have access to those numbers, but whatever they are, the effect appears to be in the same direction. I would like to see a meta-analysis, which would have some limitations given the 3 different thresholds in those 3 trials (which are as far as I know the only RCTs of platelet transfusion at different thresholds), but if the PLANET2 data are indeed consistent, and with a much greater power than the 2 other small trials, that would be very powerful data. It would confirm that not only are platelet transfusions in general ineffective in preventing bleeding at these 3 threshold levels, but they likely increase the risk of IVH. Why would that be the case? It may be that transfusing adult platelets to babies with newborn plasma, which is already hypercoagulable, causes the effect, either by capillary damage, or by causing infarctions which then become hemorrhagic, or some other mechanism. It could just be the effect of volume expansion, which can certainly cause lesions in newborn beagle puppies (see Laura Ment’s studies from the 80’s and 90’s), and many observational studies that have correlated volume expansion with IVH. Platelets are often given somewhat faster than red cell transfusions, (it does not appear to have been specified inPLANET2, the dose was 15 mL/kg, but the duration isn’t mentioned in the protocol) often over 1 hour. Volume expansion is also probably more effective than with saline, much of which rapidly leaks out of the circulation. I think either some impact on overall coagulation/anticoagulation balance or hemodynamic changes, or both, may be responsible for the apparent increase in IVH. 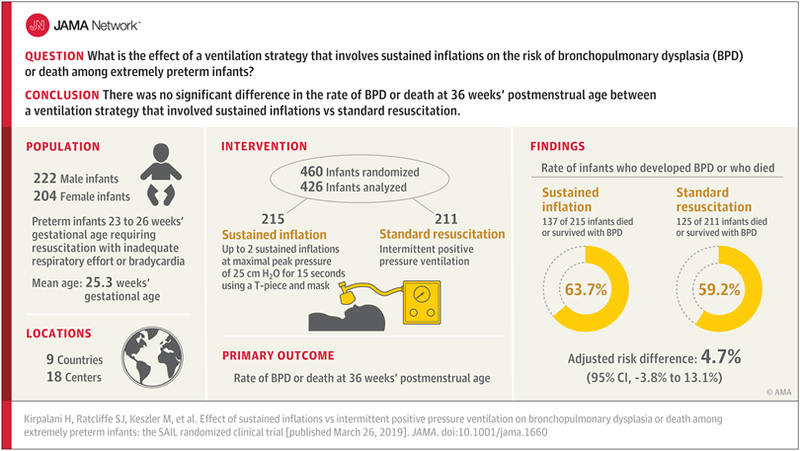 This is the multicenter randomized controlled trial of sustained inflations at the onset of resuscitation for very preterm infants less than 27 and at least 23 weeks gestation. Enrolled babies received face mask CPAP for up to 30 seconds, and if they needed PPV (i.e. apneic or gasping or heart rate <100) then they were randomized to sustained inflation or standard NRP. Sustained inflation babies started with a 15 second inflation at 20 cmH2O, they were then evaluated on CPAP and, if apneic or gasping or heart rate < 100, they switched to standard NRP, if those things didn’t apply they received a second sustained inflation to 25 cmH2O for 15 seconds. All of which was rather arbitrary, in terms of indications, pressures, and durations, but there wasn’t any reliable data to make more evidence based choices (and still isn’t). The primary outcome of the study was the infamous “death or BPD”, which I have criticised here frequently enough, I think, but just to be really annoying; being dead and having oxygen at 36 weeks PMA are not equivalent, and a composite outcome which combines them risks the real potential that they could change in opposite directions, and show no effect, or that mortality changes will be overwhelmed by the much more frequent occurrence of BPD. Mortality as one outcome and BPD among survivors, as another outcome makes much more sense. Even better would be a measure of lung injury which reflects respiratory outcomes of importance to families. As many of you will know by now, the study was stopped by the DSMC after enrolment of 460 patients because of an excess of early deaths (under 48 hours of age) in the sustained inflation group, many of which were considered to be possibly associated with the intervention. As well as stopping the trial the DSMC mandated a Bayesian analysis, which revealed that it was highly unlikely that sustained inflation would be shown to be preferable if the study had continued, and that either a null result, or an advantage of standard care were far more likely results. This is an important trial with an important message: if you want to do sustained inflation, don’t do it like this. If you want to do sustained inflation using a substantially different approach, you had better do a high quality study with careful surveillance for adverse effects, and don’t do it outside of an RCT. Failing that, I think that sustained inflation as routine initiation of resuscitation of the preterm infant should be laid to rest. The authors have done what other trials have also done recently, which is to report BPD at 36 weeks, or death at 36 weeks as being the components of the primary outcome, I still don’t understand this, as it means that death after 36 weeks without BPD is considered a good outcome! Why not survival to discharge as part of the composite? 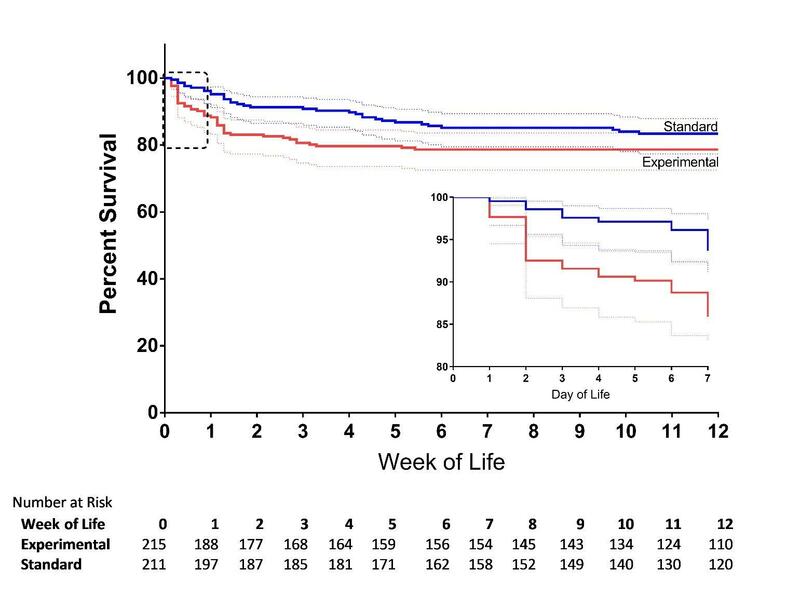 The authors collected survival to discharge (it is secondary outcome number 22), but I cannot see the result in the article or appendix. My recent discussions about significance and how to refer to results are well illustrated by the following sentence from the discussion. An unexpected excess mortality rate with sustained inflation in the first 48 hours of life led to early trial closure, although mortality at 36 weeks’ postmenstrual age was not different. Well, pardon me, but as far as I am concerned 20.9% IS different to 15.6%, they are clearly different numbers! Because the difference between 2 numbers is not “statistically significant” does not make them the same. As you can see from the survival curves below, they are a bit closer together at 12 weeks than they are at 7 days, but they remain different. It would be accurate to say, ‘the p value for the difference in death at 36 weeks is 0.17 with a relative risk of 1.3’, and to note that ‘relative differences in mortality at 36 weeks which are compatible with the data, range from a 10% decrease with sustained inflation, to a 90% increase ‘; but not just to say they are “not different”. Other secondary outcomes vary between those which are practically identical between groups, such as severe IVH (9.8% vs 10.4%), and those which are very different, e.g. pneumothorax (5.1% with SI vs 9% standard NRP). None of them were “statistically significant”. Almost simultaneously appeared in print the following Tingay DG, et al. Gradual Aeration at Birth is More Lung Protective than a Sustained Inflation in Preterm Lambs. Am J Respir Crit Care Med. 2019 a very interesting study in preterm lambs examining a sustained inflation strategy, where they used 35 cmH2O and maintained it until there was no more volume entering the lungs, and then for another 10 seconds. This was compared to ventilation with PEEP, and a 3rd strategy of ventilation with PEEP, and added progressive increases in PEEP until compliance was maximized, at which time, PEEP was progressively decreased. The sustained inflation group had very uneven lung aeration, and increased signs of lung injury. This confirms I think that we could still have some benefit from finding novel ways of ensuring early adequate uniform lung inflation, but simple sustained inflation is not the answer, at least in the immature lung. I can’t claim preference for this title, although I wish I could. I copied it from an article published in an ENT journal (Buchinsky FJ, Chadha NK. To P or Not to P: Backing Bayesian Statistics. Otolaryngol Head Neck Surg. 2017;157(6):915-8). It would certainly be much better than assuming that p<0.05 means that you definitely found an effect, or that p>0.05 means that there is nothing there! 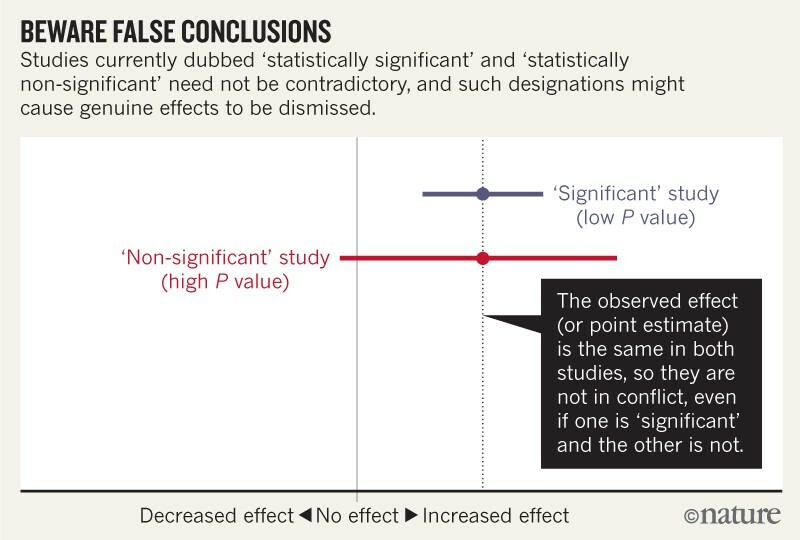 In this blog I usually try to avoid the term “statistically significant” (or not), as the term is often used to imply “proven effect” as compared to “proof of no effect”. I hope we all know that the threshold, where p=0.051 means no effect, and p=0.049 means proven effect, is nonsense. Some journals have banned the reporting of p-values and even confidence intervals, as a result. I think this is extreme, I think we should be able to report confidence intervals, but that multiple confidence intervals, 90, 95, and 99% should perhaps be demanded. And also appropriate wording, similar to what I suggested above. The risk is that a 95% confidence interval which excludes unity will be considered to be proof that there is a real difference, which is no better than using a p-value threshold. The differing confidence intervals could be used to give an overall estimate of an effect, and its potential ranges. In this blog I probably sometimes get caught up in the usual patterns of referring to p-values, but usually I try to say something like “not likely to be due to chance alone”, which does not mean that a difference is necessarily due to a real effect of the intervention, but that the data would be unlikely if you picked the numbers at random out of a soup of numbers. All sorts of things might cause a p-value to be less than 0.05 when you compare outcomes between 2 groups with a different intervention, only a minority of which are due to a true impact of the intervention. One recent paper that I liked was by Doug Altman and a group of co-workers (Greenland S, et al. Statistical tests, P values, confidence intervals, and power: a guide to misinterpretations. Eur J Epidemiol. 2016;31(4):337-50) they list the many errors that people make when talking about the statistical test results, when I read the list it makes me think of the many similar errors I have read, and probably made myself. A study with an unknown bias might well provide a “significant” p-value when there is no real effect of the intervention, just as a study with a “non-significant” p-value might report a major advance in medicine. There have been recent publications suggesting that the critical P-value should be shifted to a much smaller number (such as p<0.005), particularly for epidemiological, rather than interventional studies. But I think that will just shift the problem, and will make it harder to find really useful beneficial effects, or to potentially harmful results. Abandoning the term “statistically significant” should be enforced, and will force us to makes more nuanced and reasonable evaluations of our data. For a few years now Annie Janvier in our unit has been developing programs of partnership with families. Using contacts with mostly “veteran parents”, and occasionally veteran patients, we have developed partnerships in research, patient care, and education. The “PAF” team (équipe Partenariat Famille) have now published a report of how such family partnerships can be developed, how their impacts can be evaluated, and how our partnerships have developed and expanded as a result of those evaluations (Dahan S, et al. Beyond a Seat at the Table: The Added Value of Family Stakeholders to Improve Care, Research, and Education in Neonatology. JPediatr 2019;207:123-9 e2). Last year we published a review of integration of parents in research endeavours, (Janvier A, et al. 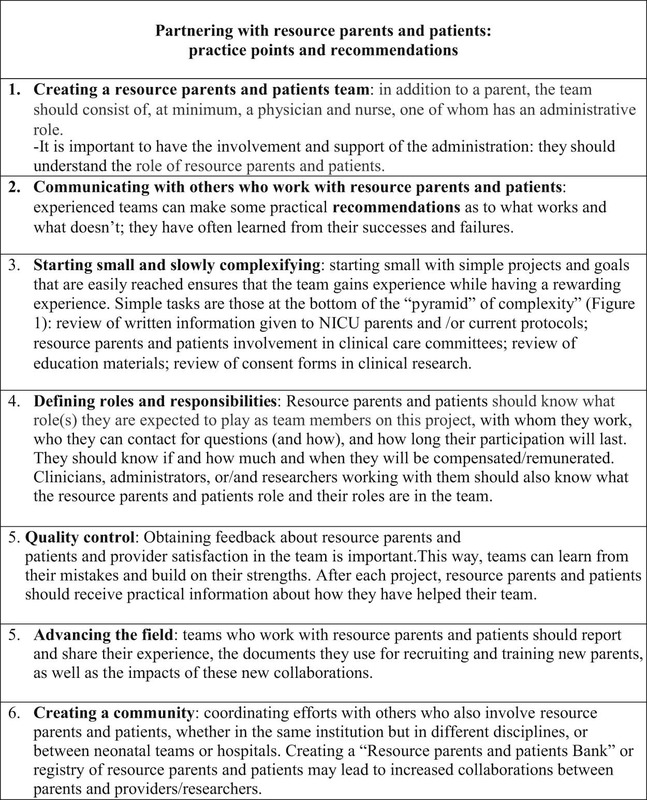 Integrating Parents in Neonatal and Pediatric Research. Neonatology. 2019;115(4):283-91) and included in that review some of our endeavours and our research about family participation specifically in research. The group also published a review article about what has been published about family participation in the NICU (Bourque CJ, et al. Improving neonatal care with the help of veteran resource parents: An overview of current practices. Seminars in fetal & neonatal medicine. 2018;23(1):44-51). The new article is an in-depth evaluation of the PAF team development, evaluation, and improvement, some of the mistakes made along the way, and some principles, many of which are probably generalizable, that can be used to help in the process. The title, I think, is apposite, although many of us have been discussing how to involve parents over the past few years, often the involvement of parents has been seen as a “nice extra”. In contrast, I think we should consider that everything that we do will benefit from the full integration of resource parents in our teams, and that having a token parent seat at the table is not enough. For anyone who doesn’t have full text access to the Journal of Pediatrics, Annie gave me permission to include the following link in this blog post https://authors.elsevier.com/a/1YnEL55CrsVAw the first 50 people accessing the link can download a free full text. The PAF initiative costs very little, but there are some costs, mostly for parking, snacks, our wall of hope, and other minor costs. Our goal for fundraising this year is only $12,000 (Canadian), please consider making a small donation to our team. If you like this blog, please consider making a large donation! Please Follow the link to our fundraising page. and click on “Donate Now”. How should we evaluate heart rate during neonatal resuscitation? Many babies receive some sort of “resuscitation” during their transition from intra-uterine to extra-uterine life. How do we decide when a baby needs intervention? A baby who is active and breathing is usually left alone, a baby who is neither of those things might need intervention, and many of our decisions are based on the baby’s heart rate. Bradycardia= needs ventilation. Mild bradycardia= optimize ventilation and reassess, good heart rate = observe and wait. I like things to be simple! Recent studies have focused on heart rate determination as the best indication that adaptation is appropriate, but that begs the question:, how to determine heart rate? Should we listen to their heart sounds, palpate their pulses, or watch their ECG? It seems that getting an accurate heart rate is faster with immediate ECG application (Katheria A, et al. A pilot randomized controlled trial of EKG for neonatal resuscitation. PLoS One. 2017;12(11):e0187730) and that this might lead to more rapid institution of corrective actions. But electrical activity of the heart does not mean that it is pumping well; in animal models pulseless electrical activity is frequent. Many immature animals, after resuscitation, have periods of electrical activity without mechanical activity. If that happens with babies, then we may have to readjust our algorithms; presence of an ECG signal does not mean that you necessarily have adequate cardiac function. A group of us interested in the issues have been discussing this for a while, and decided to write a brief article, focusing on the results from Po-Yin Cheung and Georg Schmolzer’s lab in Edmonton. (That, I always like to point out, used to be my lab! (here’s one example) but Po-Yin and Georg and doing better work from that lab than I ever did.) Patel S, et al. Pulseless electrical activity: a misdiagnosed entity during asphyxia in newborn infants? Archives of disease in childhood Fetal and neonatal edition. 2018. The new article notes that PEA (which I always used to call electro-mechanical dissociation (EMD)) occurs frequently in animals that have been exposed to clinically relevant models of perinatal asphyxia. Does this actually happen in human newborns? Yes. Luong D, et al. Cardiac arrest with pulseless electrical activity rhythm in newborn infants: a case series. Archives of disease in childhood Fetal and neonatal edition. 2019. Four cases are reported in this article, and I know personally of two others, I wasn’t able to get them into the article (of which I am co-author), but this is not something that is vanishingly rare; how frequent is it? We really don’t know, but I think we should investigate that somehow. What I think this means is that, when resuscitating depressed newborns, the ECG might be very helpful to get an accurate heart rate quickly, and if the heart rate is slow we should respond according to NRP algorithms. At some point we should confirm that there is actually cardiac contraction, not just electrical activity. If the infant starts to move and breathe, that is probably enough evidence. BUT, if the ECG heart rate is present but the baby isn’t improving, we should immediately evaluate whether there is sufficient cardiac activity. In the cases we report there was ECG activity, but no actual cardiac function detectable, when that was recognized and interventions followed, all the babies were severely damaged, and they all died. I wonder if the situation had been recognized faster, could there have been better outcomes? We could even ask if those babies would have been better treated without the ECG? Maybe the introduction of the ECG as a routine measure of cardiac activity during neonatal resuscitation has been an error? I’m not sure what the best approach is, but recognizing that the ECG only identifies electrical activity, and that actual cardiac pumping is what the baby needs, is the first step.